To start, pre-heat the oven to 400ºF. Line a large rectangular-shaped casserole dish or baking pan with aluminum foil. If you have a non-stick pan, you can skip this step. (I normally use a 9″ x 13″ dish.) Splash about 2 tablespoons of olive oil into the pan – enough to cover the bottom of the pan. Next, peel the onion, garlic, carrots, and beets. Quarter the onion and coarsely chop the carrot, beet, and potatoes. They can be bigger chunky pieces. Throw everything into the pan and distribute evenly. Slice the tomato and bell pepper. Throw these into the pan. Cover the dish with aluminum foil and put it into the oven to start baking. You’ll be adding the lamb rack to the pan a little later, but let the vegetables bake for about 20 minutes before you do. Now the lamb. Usually when you pick up your rack of lamb, your butcher will already have already frenched the bones for you (exposing the bones). From here, it’s up to you. If you prefer to remove more of the fat, you can french the bones further. If you don’t know how, here’s a video that walks you through it step by step. Personally, I prefer to leave the fat on as it keeps the meat moist, and frankly, I love the fat. Once you have your lamb rack ready, sprinkle the remaining 1 to 2 teaspoons of thyme over the meaty part of the lamb rack and rub it in. Do the same with the salt and pepper. Drizzle some maple syrup over both sides of the lamb and rub it in. When you’re done, lay your lamb bones down and take the rest of your rosemary sprig and place it on the meat of the lamb. You’re ready for the bacon. 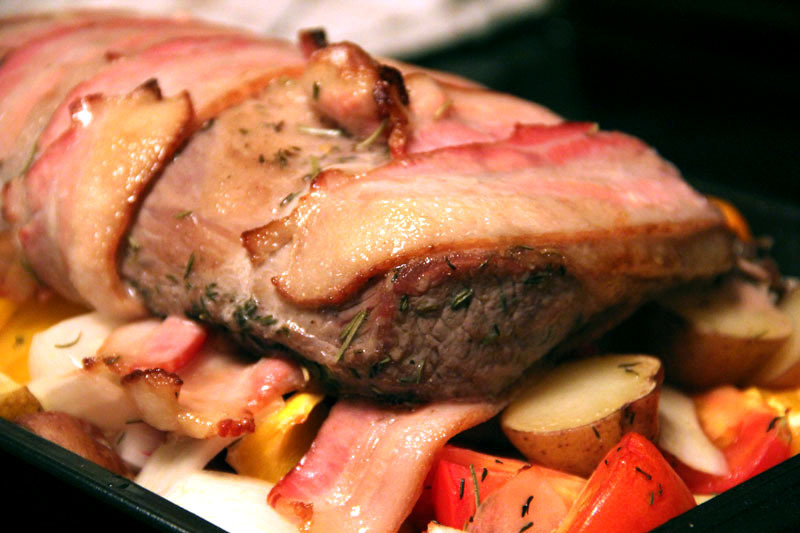 Taking one strip at a time, wrap the bacon around lamb (and sprig of rosemary) through the spaces between the bones. Wrap the whole lamb rack until the meat is covered. At this point, remove your pan of vegetables from the oven, remove the foil cover, and place the lamb on the vegetables bones up. Put the pan back into the oven without the cover. Bake for about 25-30 minutes. 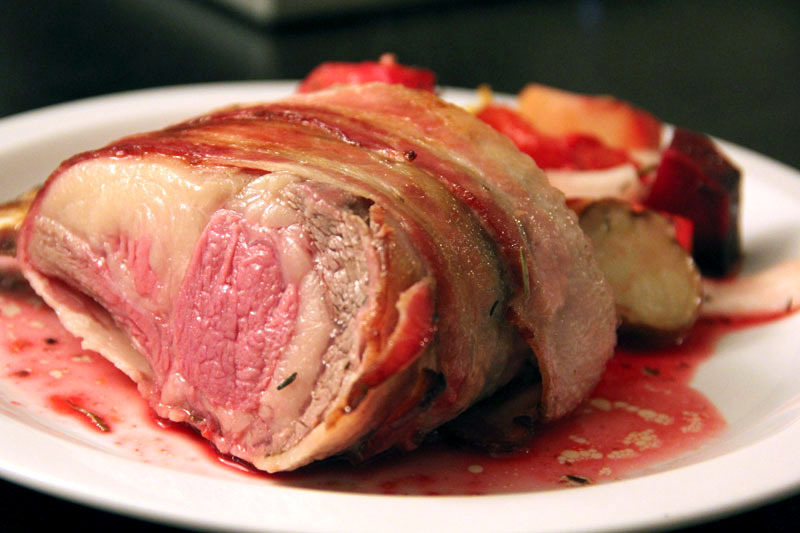 At the end of that time, the bacon should be browning and you can check the lamb by pressing on the meat. If it’s rather soft, it’s not done. I use the finger test to check on my meat. I like my lamb done medium-rare, and if you do too, the meat it should feel the same as how the meaty part of your palm at the base of your thumb feels when you bring the tip of your middle finger to the tip of your thumb. If you like your meat cooked a little more, it’s how it will feel when you bring the tip of your ring finger to the tip of your thumb (medium), or pinky finger to your thumb (well-done). This next step is optional. When the lamb is almost done, I open the oven door a crack and set my oven to broil on high to roast the vegetables a little and grill the surface of the meat slightly. All it takes is a few minutes, so if you choose to do it, keep an eye on the meat and vegetables so they don’t get singed. When it’s done, the lamb and vegetables should look a lot like this picture here. Take the pan out and cover it with tin foil again and allow the meat to rest for about 10 minutes. This will ensure the juices stay in the meat and every bite will be that much juicier when you serve it. This entry was posted in Mains and tagged bacon, lamb, maple syrup, meat, roast vegetables, root vegetables. Bookmark the permalink. I have to say this was a wonderful and filling recipe. I’m no expert on making lamb but this was an easy recipe to follow. Exceptional taste! Wow, I thought this would call for too much maple syrup but I was surely wrong. Didn’t use beets because I’m not a fan of beets but the recipe fell together wonderfully. I recommend this recipe to anyone that’s looking to have great comfort food or to impress guests for dinner. Thanks for your comment and letting me know how the recipe turned out for you, Theresa! You made my day. I’m glad it came together – by the sounds of it, beautifully. Removing the beets is definitely encouraged if you’re not a beet fan. You can also substitute any of the root vegetables with ones you like – even turnips, yams and sweet potatoes work well.